In a suite at Soho’s Ham Yard Hotel, Lupita is curled up on the sofa. Dressed in all black she looks striking, although understandably a little jaded by the all-day press junket. Having spent what I imagine is several hours in the same spot, she’s become settled, her feet kicked up, rifling through her handbag for the first few seconds of our chat. However, it’s not long before her trademark charisma and poise surfaces. She leans in as she answers, each sentence thoughtful and beautifully spoken. The Oscar-winning actor is in London to promote Us – Jordan Peele’s highly anticipated follow-up to Get Out – in which her character Adelaide and husband Gabe (played by Black Panther co-star Winston Duke) head to the Santa Cruz coast with their children for the summer, only to find themselves confronted by their soulless, murderous doppelgangers. It’s exceptionally chilling – and when Adelaide is juxtaposed with her eerie double Red, Lupita’s range becomes even more evident. Reviews of her performance have been rapturous. 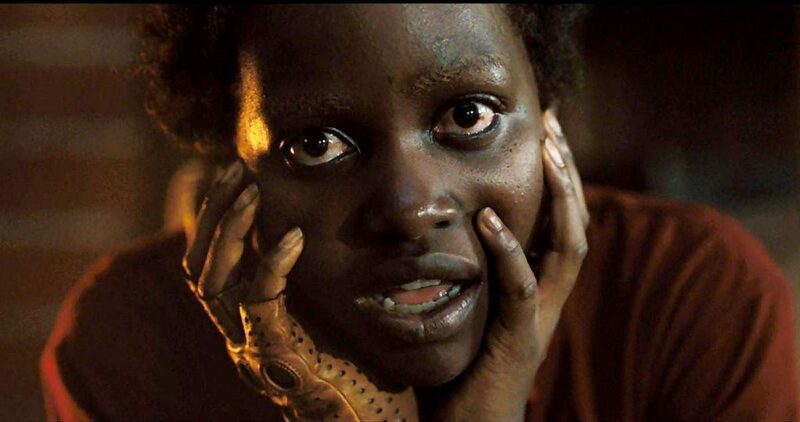 It was back in 2013 that Lupita’s became something of an overnight success when, straight out of Yale’s MFA Acting program, she appeared in Steve McQueen’s 12 Years A Slave, stealing the show with a heart-rendering performance as Patsey – and subsequently winning the Academy Award for Best Supporting Actress. Since then, her CV has spanned everything from the Star Wars franchise, where she’s CGI-ed beyond recognition as alien pirate Maz Kanata, to 2016’s Queen of Katwe, playing the mother of a chess prodigy living in the Ugandan slums. Last year, she joined the Marvel universe in the groundbreaking Black Panther blockbuster as Nakia, a whipsmart Wakandan spy and King T’Challa’s refreshingly dark-skinned love interest. For Red, prep was equally immersive. “There was a line in the script that said she had not used her voice for a long time and so I wanted to have a very specific kind of raspy voice,” she explains. “I was inspired by… spasmodic dysphonia, which is a condition that is brought about by emotional or physical trauma and it creates this involuntary spasming of the vocal folds.” Her homework clearly paid off: when the latter of the two first opens her mouth on screen, it’s so unexpected that you almost instantly forget it’s the same person. When describing working alongside the film’s producer, screenwriter and director, Lupita speaks effusively. “Jordan is very fun to work with. He’s very even-keeled, he never loses his temper, he’s very communicative… I mean he should teach a class in communication.” She explains that it was also a highly collaborative process; while Peele would provide precise yet enigmatic notes as a starting point (Red was described by Peele as “queen and cockroach”), she was often invited to chip in. “He wants to hear your idea,” she says. “We’ll have healthy arguments… and he’s very generous with information as well. He doesn’t hide his process – he shares it.” He let the actors “play as wildly as we wanted”. Likewise, Black Panther symbolised a breakthrough moment – a film with an almost all-black cast that went on to smash box office records, rack up critical acclaim and subvert out-dated ideas of what “sells” in the process. On the press tour for the film, Lupita spoke about how significant it was seeing her home continent represented in a new light, and praised the movie’s portrayal of black women. “The fact that this particular image has natural hair, and dark skin, and women in positions of power, it’s just a whole lot of things that are really just going to change the way children see themselves,” she told gal-dem last year. But arguably the most seismic moment in Hollywood of late has been #MeToo, and in October 2017, Lupita joined the movement, revealing in the New York Times that she, like many other actors, had been allegedly harassed by Harvey Weinstein, back when she was a student. “I speak up to make certain that this is not the kind of misconduct that deserves a second chance,” she wrote in the widely read essay. The on-going worldwide tour for Us aside, Lupita is booked and busy. Since 2014, she’s been a spokesperson for Lancôme, her lustrous skin and flawless features reaffirming the beauty of dark-skinned women on billboards, at makeup counters and in glossy magazines. And more recently, she signed a contract with Calvin Klein, appearing in ads for their perfume alongside fellow movie star Saoirse Ronan. She’s also hard at work behind the camera, last year revealing that she’s producing a miniseries based on Chimamanda Ngozi Adichie’s Americanah. And then there’s her children’s book, Sulwe, which tells the story of a dark-skinned girl who comes to embrace her complexion, and is due to be released this year. In her ambitions at least, Lupita seems pretty fearless. And in all honesty, what’s to stop her? With such staggering talent (there’s already Oscar buzz around Us) and a quiet, steely confidence, right now she has Hollywood – and the rest of us – in thrall.